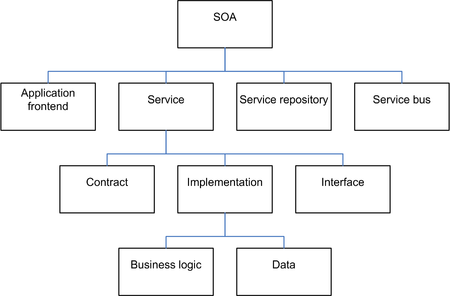 A service-oriented architecture (SOA) is a style of computer software where services are provided to the other components by application components, through a communication protocol over a network. 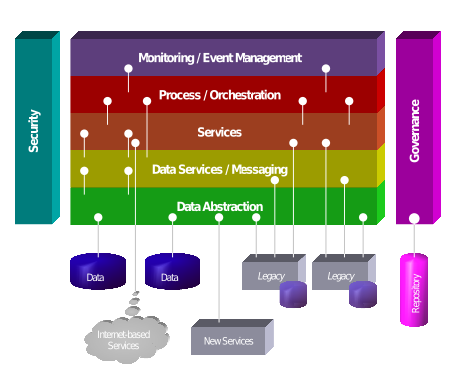 The basic fundamental principles of service oriented architecture is independent of vendors, products and technologies. A service is a discrete unit of functionality that can be accessed remotely and acted upon and updated independently, such as an act of retrieving a credit card statement online. Different services can be used in conjunction to provide the functionality of a large software application. Service-oriented architecture makes it easier for software components to communicate and cooperate over the network, without requiring any human interaction or changes in the underlying program, so that service candidates can be redesigned before their implementation. In SOA, services use protocols which describe how they pass and parse messages using description metadata, this metadata describes both the functional characteristics of the service and quality-of-service characteristics. Service-oriented architecture aims to allow users to combine large chunks of functionality to form applications which are built purely from existing services and combining them in an ad hoc manner. A service presents a simple interface to the requester that abstracts away the underlying complexity acting as a black box, Further users can also access these independent services without any knowledge of their internal implementation. Strategic goals is given more importance than project-specific benefits. Shared services is given more importance than specific-purpose implementations. Services are stateless that is either return the requested value or a give an exception hence minimizing resource use. Logic is divided into various services, to promote re use of code. It creates a web service and provides its information to the service registry. Each provider debates upon a lot of hows and whys likes which service to expose, whom to give more importance: security or easy availability, what price to offer the service for and many more. The provider also has to decide what category the service should be listed in for a given broker service and what sort of trading partner agreements are required to use the service. Is is also known as the service registry. Its main functionality is to make the information regarding the web service available to any potential requester. Whoever implements the broker decides the scope of the broker. Public brokers are available anywhere and everywhere but private brokers are only available to a limited amount of public. The service consumer-provider relationship is governed by a service contract, which has a business part, a functional part and a technical part. Implementers commonly build SOAs using web services standards (for example, SOAP) that have gained broad industry acceptance after recommendation of Version 1.2 from the W3C (World Wide Web Consortium) in 2003. These standards (also referred to as web service specifications) also provide greater interoperability and some protection from lock-in to proprietary vendor software. One can, however, implement SOA using any service-based technology, such as Jini, CORBA or REST. Some enterprise architects believe that SOA can help businesses respond more quickly and more cost-effectively to changing market conditions. This style of architecture promotes reuse at the macro (service) level rather than micro (classes) level. It can also simplify interconnection to--and usage of--existing IT (legacy) assets. SOA has been conflated with Web services. ; however, Web services are only one option to implement the patterns that comprise the SOA style. In the absence of native or binary forms of remote procedure call (RPC), applications could run more slowly and require more processing power, increasing costs. Most implementations do incur these overheads, but SOA can be implemented using technologies (for example, Java Business Integration (JBI), Windows Communication Foundation (WCF) and data distribution service (DDS)) that do not depend on remote procedure calls or translation through XML. At the same time, emerging open-source XML parsing technologies (such as VTD-XML) and various XML-compatible binary formats promise to significantly improve SOA performance. Services implemented using JSON instead of XML do not suffer from this performance concern. Microservices are a modern interpretation of service-oriented architectures used to build distributed software systems. Services in a microservice architecture are processes that communicate with each other over the network in order to fulfill a goal. These services use technology agnostic protocols, which aid in encapsulating choice of language and frameworks, making their choice a concern internal to the service. Microservices is a new realisation and implementation approach to SOA, which has become popular since 2014 (and after the introduction of DevOps), which also emphasizes continuous deployment and other agile practices. ^ "Chapter 1: Service Oriented Architecture (SOA)". msdn.microsoft.com. Retrieved 2016-09-21. ^ "What Is SOA?". www.opengroup.org. Retrieved 2016-09-21. ^ "Migrating to a service-oriented architecture, Part 1". 2008-12-09. Retrieved 2016-09-21. ^ M. Hadi Valipour; Bavar AmirZafari; Kh. Niki Maleki; Negin Daneshpour (2009). "A brief survey of software architecture concepts and service oriented architecture". 2009 2nd IEEE International Conference on Computer Science and Information Technology. pp. 34-38. doi:10.1109/ICCSIT.2009.5235004. ISBN 978-1-4244-4519-6. ^ Rotem-Gal-Oz, Arnon (2012). SOA Patterns. Mannikng Publications. ISBN 978-1933988269. ^ "SOAP Version 1.2 ??????? (W3C ??)" (in Japanese). W3.org. Retrieved August 13, 2012. ^ Kyriazis, Dimosthenis; Tserpes, Konstantinos; Menychtas, Andreas; Sarantidis, Ioannis; Varvarigou, Theodora (2009-04-25). "Service selection and workflow mapping for Grids: an approach exploiting quality-of-service information". Concurrency and Computation: Practice and Experience. 21 (6): 739-766. doi:10.1002/cpe.1343. ISSN 1532-0634. ^ a b Christoph Schroth & Till Janner (2007). "Web 2.0 and SOA: Converging Concepts Enabling the Internet of Services". IT Professional 9 (2007), Nr. 3, pp. 36-41, IEEE Computer Society. Retrieved February 23, 2008. ^ "Microservices: yesterday, today, and tomorrow" (PDF). Retrieved 6 July 2016. ^ Balalaie, A.; Heydarnoori, A.; Jamshidi, P. (2016-05-01). "Microservices Architecture Enables DevOps: Migration to a Cloud-Native Architecture". IEEE Software. 33 (3): 42-52. doi:10.1109/MS.2016.64. ISSN 0740-7459. Keen, M. et al. : Patterns: Implementing an SOA Using an Enterprise Service Bus, IBM Redbook, 2004. Software Evolution: From Legacy Systems, Service Oriented Architecture to Cloud Computing.